Where do you get your inspiration for cards? From everything - literally. Ideas DO just pop in my head out of the blue sometimes - but the rest of the time yes something inspires me - and it can be any number of things: a magazine ad/article, clothing, online site (check out this card I made inspired by a website's homepage here). See what I mean?? What is your favorite color? What is the color of paper that you constantly find yourself reaching for? Oooohhhh see I'm rotten at these kinds of questions - I like it ALL!! However I do find that I go through a lot of Certainly Celery and Bashful Blue SU card stock, along with Chocolate Chip - so yes those are definitely more loved *wink*. What do you do with all your extra samples? As in everything that gets posted on here? 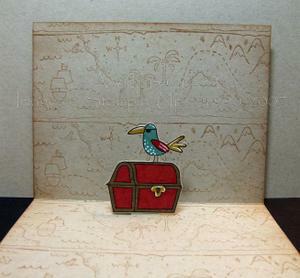 Well, a lot of the 3D items (frames, boxes, etc etc etc) are made specifically for someone or for something. Some are for design team work that gets sent away to the owner. The rest just pile up here LOL! I often wonder how you juggle being a SU demonstrator and then using all the other wonderful stuff that you have. It must be hard to demonstrate just SU products at a club or workshop. Actually I don't have any trouble with that. 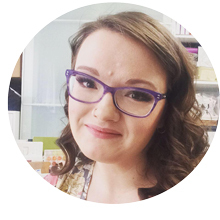 My demo-ship is a totally separate thing for me - you all can see that this blog was never started to promote my "business" but rather share my love of stamping with y'all!! I am VERY fortunate to have a (very) small base of some wonderful customers that keep me active. I have one small bi-monthly club going and between that and my other (FABULOUS!) customers (they all read this so I have to say Hi!! *waves*) they keep me going. I actually don't have any trouble sticking to JUST SU! during clubs/workshops etc - I literally own almost every single accessory in the catty (no joke) and after over 2 years of being a demo I own a LOT of sets too - so I have quite a lot to choose from! Of course all my customers KNOW that I have a ton of "contraband" ROFL ----------- but they also know about my requirements when I'm wearing my demo hat and it's never been an issue. What tool do you want next? Hmmmmmmmm - well I guess it would have to be one of the bigger ones - I've had my eye on the RubiCoil and the Cricut for a looonnnngggg time now. I still can't justify spending that much $$ on either of them right now (not to mention can't afford them either!) as I'm not sure how much I would use them - I just want them LOL! Are your classes generic or SU specific events? You do such creative things with many mfg products that I imagine it's hard to limit yourself to one vendor! I might be a ditz but can you explain when using decorative scissors how can you cut straight lines to make the border even? Nope not a ditz - I actually get asked this a lot. 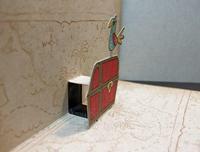 AND I just stumbled across this post by Leslie Miller on her blog that gives a great tip: Using Decorative Edge Scissors. For me personally I just eyeball it (and more often than not I get it right the first time - not always tho!) as I am too lazy to grab my ruler and a pencil ROFL!! A lot of people have asked me if I ever get the chance to "play" and just stamp for fun. The answer is undoubtedly YES!!! If I never got the chance to do that I'd implode ROFL!! In fact the past few days that's ALL I've been doing - just messin' around and making cards using whatever I want and doing whatever I want (don't worry I will be sharing them on here - I just need to get pics taken of them!). 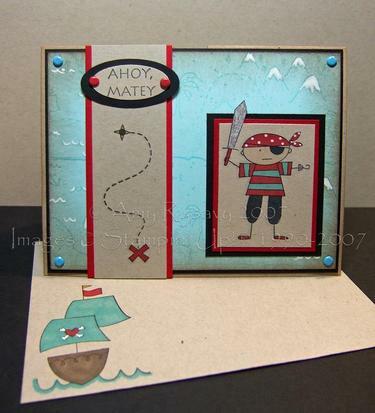 Here's something that should tide y'all over till I can get some stuff posted: check out Lauren's blog post and see all the cards she made with the Bitzy Bugz!!! I just about fell off my chair when I saw them all - they are SO cute!!!!! Invasion of the Bitzy Bugz!!! <-------------------CLICK!! What is gamsol and how do I use it? I see that you are on several design teams. What does a senior design team member do that the others don't? Also is there ever a conflict of interest? For me - I happen to be on some WONDERFUL Design Teams and work for some fabulous people and don't have to worry about any conflict of interest. All of them know who I "work" for and what I do and they're all fine with it. I know that some companies have it written into their contracts that if you design for them you can't design for company "x, y and z" (which has more to do with not being on teams for companies that have similar stamps and whatnot - it wouldn't make sense to be on a team for "company a" AND on a DT for "company b" when they both sell similar (ie competing) products you know what I mean??). I also have come across some DT applications that state they don't want you to work for ANYONE but them - but I'm not on those kinds of teams - and wouldn't want to be - I like having options and there are SO many different stamp companies out there that I LOVE!! How do you chose which embellishments to use together? Well honestly - I don't put too muck thought into it. I just grad whatever is handy!! 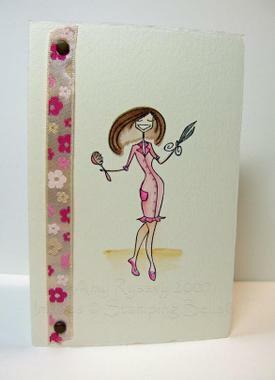 Ribbon is one thing I use on almost EVERY card - so that's a no-brainer (for me). Same with brads - they are so quick and easy that I just tend to use them fairly often. 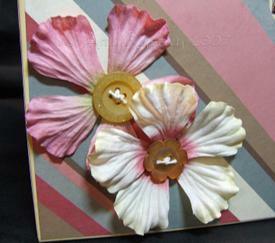 For other embellies it just depends on my mood and the type of card I'm making . How do you find inspiration (especially when working on a deadline) and nothing comes to mind? Ahhhhhhhhh -------- inspiration. THAT question seems to be the MOST often asked question ------ WHERE do I get my inspiration??? When it comes to meeting a deadline - I just DO it!! I don't often have to really hurry to meet a deadline but when I do I just sit and stamp!! I find that when my adrenaline gets pumping and I get creating I do some of my best work - and I fully enjoy it actually!! If given only 1 choice of medium to color stamps with - what is your favorite? I was approached yesterday by a relative that just recently purchased a candle business to supply cards that can be purchased with the gift baskets. He wants to start with Mother's Day cards because of a grand re-opening thing. I have many questions, but one simple one is "should I put a verse/saying/poem etc inside or just make the cards all blank and let everyone write their own?" Hmmmm well it all depends on your area and what people would prefer. I would ask around and see what the general consensus is - blank insides or a verse?? I personally have the hardest time with this as people will LOVE the card but then will open it and not like the verse inside! Or they LOVE the card then open it and say "But it's blank?" ------------------- Maybe do a mix of BOTH - some with verses and some without - so then people can CHOOSE what they want. My question is how do you come up with your color combo's? Do you start with paper, ribbon? This ALWAYS varies - sometimes it a piece of patterned paper I want to use, or some ribbon, or an embellishment. OR sometimes I have an idea in my head and try to work with that. A winner has been chosen - but you can still post questions if you'd like!! Please read the rest of this post for more info!! I'll draw a number at random from the total comments on Saturday (Apr 21). I'm off to bed - it's been a loooonnnngggg day!!! WOW I never expected so many responses!! So I'll be doing the draw TONIGHT (Friday Apr 20) which is still several hours away. Don't worry tho I may have more "candy" up my sleeve *wink* - y'all will just have to stay tuned! ALSO - don't forget I've already started posting some answers - you can see them here and here. I think your website is great. How do you keep up the motivation to update so frequently. I love that you update frequently with quality posts. (I used random.org to pick a random # from the # of comments (plus I added a couple for the e-mails I got). CONGRATS Amber!! Please e-mail me with your mailing addy and I will get this sent out to you! (FYI all these pictures can be clicked on for a pop-up window with a larger view - I will also upload them into my "Bella Gallery" on the left). These past couple of days I've just had a blast just playin' around with my Bella stamps - it's nice to take a "break" sometimes and just stamp for fun. The first one (using teddybella) I of course masked her and used my A Muse small oval (you can learn more about masking here). I used Stampin' Write markers (SU!) to color her in. The patterned paper for that card is from Chatterbox, the sentiment is a Michael's $1 stamp, and the polka dot ribbon is by May Arts. For card #2 I used the Sistahoodabellas and some more Chatterbox paper. I did paper piecing on all their outfits (stamped the images onto the patterned paper then cut out only the parts I wanted to glue over the main image). The Splitcoast Sketch Challenge this week is perfect in my opinion for using up patterned paper scraps - so I may try and see if I can do a couple more cards like this and use up some more of my random pieces of patterned paper! The main image was stamped onto watercolor paper with Black StazOn and I watercolored them all in with various Stampin' Up! re-inkers and a watercolor brush. I also added a bit of "bling" with my Sakura Stardust pen. The ribbon is again May Arts, and I used another one of my Tiny Tags from the CuttleBug Tiny Tags die along with the sentiment from the newest Papertrey set - Faux Ribbon. I just slipped the ribbon through the slot on the tag and then held the other side in place with a mini glue dot. When you see the larger image you can see that I stamped the card base with the Weave BG by Cornish Heritage farms (man it's been a while since I've used any of my BG stamps!!). For the last one I used the scissorbella stamp and stamped her using Stazon onto a Fabriano Note card (got those from StarLitStudio - they are SO plush - I just love the texture to them and they are wonderful for watercoloring on - and YES I've been hoarding them - I can't help it!!!!). I used more Stampin' Up! re-inkers to watercolor her in with and a tiny bit of Clearsnap Fluid Chalk ink was watercolored with as "ground" (you CAN watercolor with the chalk inks you just need a non-absorbing surface (like a SU plastic stamp case) to press some ink onto - and then pick up the color with a wet watercolor brush. The results are different then what you get using dye ink but still fairly easy to do). I had to take a close up shot of the card so y'all can see the "special effects" I added. The ribbon is by Maya Road (which was the color inspiration for the card) and I cheaped out as I was making the card and attached a smaller piece with brads instead of wrapping it all the way around and tying it in a knot ROFL!! However it IS a good thing to keep in mind if you have smaller lengths of ribbon on hand that are too short to wrap around anything - you can either do a small "flag" like I did on the first card (I used SU! moss grosgrain ribbon and a SU! Pretty in Pink brad) or attach longer pieces with a couple of brads like I did here. Well that ain't gonna happen b/c my list is WAY longer than 5 - it's got to be well over 30!!! Oh and when you have the time - you MUST check out the "Sites That Link Here" and the "Blogs I Browse" lists down on the right (don't ask me why I still have them in two separate lists - there are a TON of fabulous blogs listed in there and definitely worth the time to persue!!) - my list of blogs I read (I use my Internet Explorer Favorite Feeds to read all mine - it lets me know when they are updated - all I know is that it works for me LOL!!) is pretty huge and I try to check in daily (or at least when they're updated!). The sentiment (also from Stamping Bella) sums up this card quite well I think LOL! I used the Word Window punch and added the ribbon (a la Sharon Harnist! She does that a LOT on her cards and it always looks so cute!). The patterned paper on this card is from Basic Grey - the Romani/Gypsy line in the 6x6 pack - all the ribbon is SU! 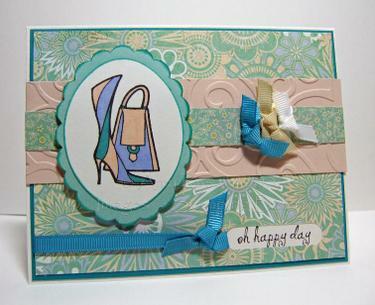 STAMPS: Matching Set and Oh Happy Day sentiment by Stamping Bella. CS: Bristol White, Blush Blossom and Taken with Teal (SU! ), Basic Grey Romani patterned Paper. INK: Palette Hybrid Noir, Clearsnap Fluid Chalk Ink in Aquamarine, Prismacolor Markers in: Light Peach, Aquamarine and Blue Slate. 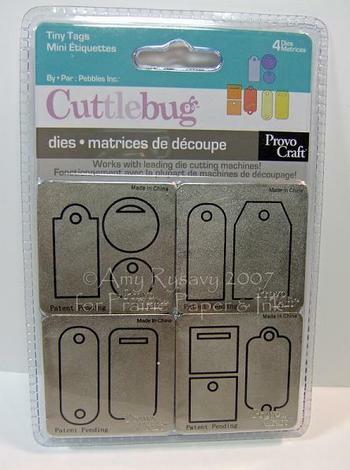 ACCESSORIES: Marvy Uchida Mega Oval and Giga Scalloped Oval Punches, CuttleBug D'vine Swirl A2 Embossing Folder, SU! Word Window Punch, SU! Grosgrain Ribbons, Dimensionals. I used the large skinny oval to ground this javabellas image (this is one of my favorites out of all the bellas (notice I said ONE OF my favorites - b/c I have a lot ROFL!). I used Stampin' Up ink and SU! markers for this (except the black which was stamped with Palette Hybrid Noir ink) - with the colors being inspired by the patterned paper (from Chatterbox). The sentiment is from Papertrey - the newest Faux Ribbon set - a lot of the sentiments fit PERFECTLY on the CuttleBug Tiny Tags die (thank you Taylor for pointing that out!!) - which ROCKS - I will be using these sentiments even MORE now b/c of this!. To finish off the card I added a Prima Daisy with a big Making Memories rhinestone brad - I need to stop hoarding those things and USE them more! STAMPS: Javabellas by Stamping Bella, sentiment by Papertrey - Faux Ribbon set, Large Skinny Oval by A Muse. 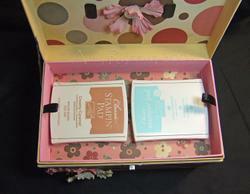 CS: Bristol White, Regal Rose, Mellow Moss, Pretty in Pink, Patterned Paper by Chatterbox. INK: Palette Hybrid Noir, Various SU! 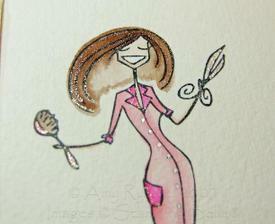 markers, Blush Blossom, Clearsnap Pigment ink in Cream White. ACCESSORIES: May Arts Ribbon, CuttleBug Tiny Tags die, lightweight chipboard coaster, Prima Daisy, MM Rhinestone brad. I actually made this card a few weeks ago when my Prismacolor markers first arrived. I used Stampin' Up! 's Very Vanilla CS for the main image (a barn stamp by GinaK Designs from here) and colored it in with the markers. I gotta say - I really DON'T like the Whisper White or Very Vanilla card stocks for these markers. It is REALLY hard (for me anyway) to get them not having any lines and whatnot (tho in real life on this card it's NOT quite this obvious - the camera really picked up on all the "light spots"!). I just got some Bazzil Smoothies CS recently and plan on trying those out with my markers - I'm thinking my issue with the SU! ones is the Ultra-smooth finish - it's great for stamping and getting a crisp image - AND great for the Prismacolor PENCILS (with Gamsol) but NOT great for the markers. This is just my opinion tho! Anywho - back to this card. The patterned paper is more of my Cosmo Cricket Jitterbug paper and I don't know if you can tell but I pierced the paper all around the main image. The brown and red CS are Bazzil Fourz, and the ribbon I got at Michaels eons ago. 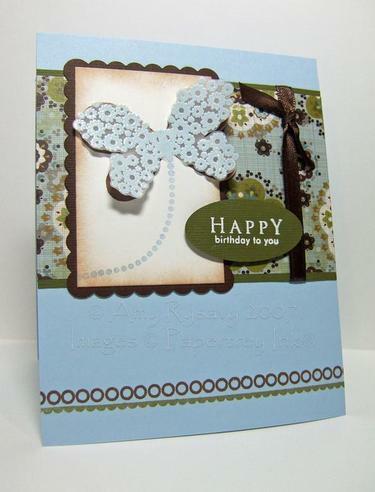 The sentiment (also by GinaK) was stamped using Clearsnap Fluid Chalk Ink in Bisque. This card measures 4x7.75" so it will fit in a standard-sized business envelope. 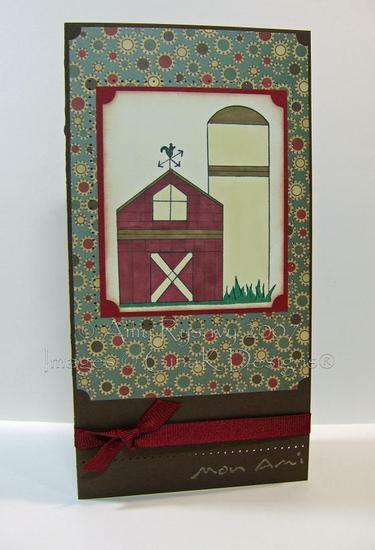 STAMPS: Barn and sentiment by GinaK Designs. CS: Very Vanilla, Bazzil Fourz, Cosmo Cricket Jitterbug patterned paper. INK: Palette Hybrid Noir, Clearsnap Fluid Chalk Ink in Bisque, Creamy Caramel (SU! ), Prismacolor Markers in: Cream, Light Umber, Tuscan Red, Dark Green. ACCESSORIES: SU! Ticket Corner Punch, Sponge Dauber, Ribbon, Paper Piercer. I made 4 cards for this reveal - and prolly coulda done more if I had had the time - once I started playing with the set I didn't want to stop!!! You can see the rest of the ones I did here (and all of the cards in the Ink Pad gallery can be clicked on to get a pop-up window with a larger view and all the supplies info and whatnot for each card). Also make sure to check out all the other gorgeous creations - Debbie, Lisa, Heather, Nichole, Ellen and Taylor really outdid themselves - their creations are fabulous!!! *claps hands*!! 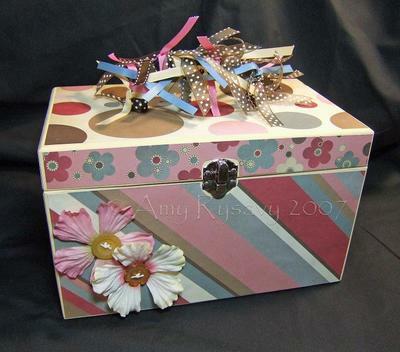 Altering this box was so much fun!! It's called a Travis Case (made by Bare Elements) and I got it from Eclectic Paperie (they DO ship to Canada you just need to contact them with what you want and they can find out how much shipping will be - they charge exactly what it costs to ship - tell them AmyR sent you - the owners (Joy and Daisy - Hi gals!!!) are FABULOUS to deal with!!). Anywho - I painted all the exposed areas of the box with different colors of Making Memories Scrapbook paint (the three colors I used were Buttercup, Strawberry Cream, and Sky), and used up a bunch of my Cosmo Cricket Jitterbug paper on it too. I used Mod Podge to adhere all the paper (and yes by the time I was done I was covered in paint and Mod Podge - but I had FUN!!!). FYI -- I got my Cosmo Cricket paper at my local scrapbook store but both Eclectic Paperie and Jacksonbelle carry it. These fabulous Prima flowers I got from StarLitStudio, and I used buttons from my stash for the centers (the lower right one is flower-shaped - I LOVE that button and have been hoarding it for something special and thought this project was the perfect time to use it!!!). 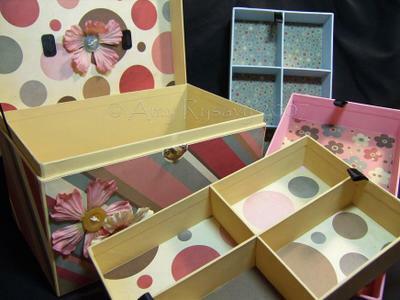 I sewed on all the buttons with string and then attached them to the box with glue dots. The case is actually quite large - I took this picture of it with the 2 Stampin' Up! ink pads just to give y'all an idea of the actual size. (all these pics can be clicked on to get a pop-up window with a larger view). I painted all the inner trays different colors, and lined the bottoms with different patterns of matching paper. The *only* thing I had difficulty with was removing the handle - I had to use pliers and it took me a long time b/c I kept slipping and I didn't want to wreck the box since it's made out of paperboard!! I managed to get it off tho which made it SO much easier to cover the lid (both inside and out! ), and then I disguised all the marks I made on the handle with the pliers by tying a bunch of ribbons on it. Now I kinda want to get more Bare Elements items to alter b/c I had a total blast doing this one!!! Get it???? *bouncin* ------ LOL as I was making this card the title just popped in my head so I HAD to make a separate post for this card (instead of including it with the other two I made here). This little inchworm stamp by GinaK just makes me grin (you can get it here) - and it was only after I stamped him on the patterned paper that it totally hit me that the "March" took on a whole different meaning ROFL!! Anywho - like the previous two GinaK cards and the CC Designs cards I did - this one uses the same sheet of Sweetwater patterned paper. I had fun coming up with all these different cards with this one sheet! I stamped the inchworm onto the white CS (all the white CS on this card is Bazzil Washboard Snow CS - I just stamped on the smooth side so that the ridges wouldn't show), then colored him in w/ my Prismacolor markers and punched it out with a Mega Scalloped Oval. 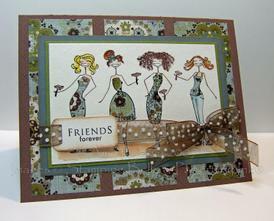 The patterned paper was stamped using Clearsnap Fluid Chalk Ink in Olive Pastel. I mounted the main image onto the card over a Giga Scalloped Oval using dimensionals and added a couple of buttons from my stash with string. The sentiment was stamped onto a strip of CS, then I cut slits in it with a craft knife and slipped this May Arts Olive ric rac through it (I got that from StarLitStudio). I created the scalloped mat with Bazzil Fourz CS and my Fiskars Scalloped Scissors, adhered it all to a white CS base and that's it!! 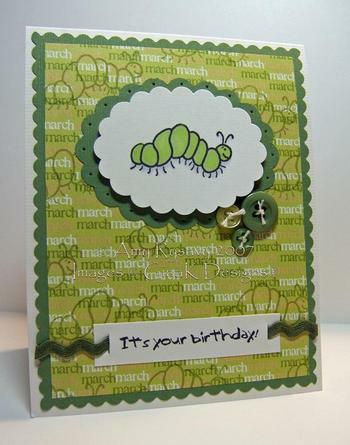 STAMPS: Inchworm and sentiment by GinaK Designs. CS: Bazzil Snow Washboard, Bazzil Fourz (Olive), Patterned Paper by Sweetwater. INK: Palette Hybrid Noir, Clearsnap Fluid Chalk Ink in Olive Pastel, Prismacolor Markers in: Chartreuse, Cool Grey 10%. ACCESSORIES: Buttons, String, Marvy Uchida Mega and Giga Scalloped Oval Punches, Dimensionals, May Arts Ric Rac, Fiskars Scalloped Scissors, Paper Piercer.